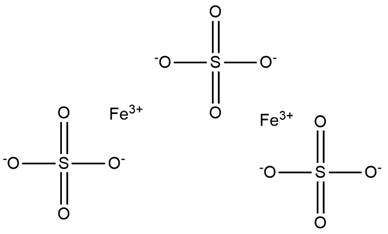 Ferric Sulfate is also named as the iron sulfate. This is an inorganic salt that is used for water purification and industrial wastes. It could be defined as an oxidizing agent too. The chemical formula for the compound is given as Fe2(SO4)3 with a molecular weight of 399.858 g mol-1 approx. It is found in nature in large quantity and it has rhombohedral crystals. The chemical structure for the compound could be given as below. It is found in a variety of minerals and mostly it is extracted from nature only. If you wanted to prepare it chemically then it could be manufactured by mixing ferric oxides and sulfuric acid together. Thus, ferric sulfate is prepared by injecting chlorine to a ferrous sulfate solution. When we look at the physical properties of the compound, it is available in white to grey color powder form or it could be a yellow crystalline solid in the hydrated state. The odor of compound may vary based on the number of water molecules available in the salt. The density of the compound is defined as the 3.097 g mL-1 (anhydrous) and its melting point is 480 ºC (anhydrous) and 175 ºC (nonahydrate). It cannot beget dissolved in sulfuric acid, acetone or ethyl acetate etc. Further, the compound can be used for wastewater treatment operations or it can be used as a coagulant to eliminate the odor of the compound. This is defined as the strong separation agent or oxidizing agent and its applications are seen in pigment industries too.